Stocks fell in volatile trading on Tuesday, failing to regain their footing after suffering steep losses in the previous session. The Dow Jones Industrial Average fell 100.69 points to 25,286.49, while the S&P 500 dipped 0.2 percent to 2,722.18, posting its fourth straight decline. The Nasdaq Composite closed just along the flatline at 7,200.87. At their session highs, the Dow and S&P 500 were up more than 100 points and 1 percent, respectively. The Nasdaq had gained as much as 1.6 percent. 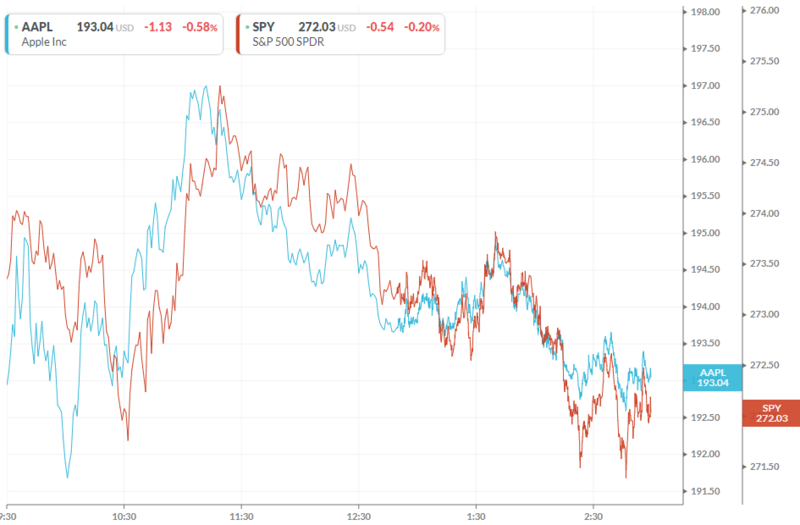 The major indexes hit their session highs after White House economic advisor Larry Kudlow confirmed reports of renewed talks between the U.S. and China on trade. Energy was the worst-performing sector as crude prices fell to their lowest levels in a year. The stock market appeared to be moving at the whim of Apple, falling back into the red in the afternoon after Apple had moved lower. Tuesday's moves come after the Dow dropped 602 points on Monday as Apple shares dropped on expectations of slowing iPhone sales. Apple's stock declined after Lumentum Holdings, one of its key suppliers, cut its outlook. Lumentum CEO Alan Lowe said in a statement one of its largest customers asked the company for a "material" reduction of shipments for its products. This led to Goldman Sachs cutting its iPhone sales estimates and to J.P. Morgan downgrading Lumentum's stock. Randy Frederick, vice president of trading and derivatives at the Schwab Center for Financial Research, said there may be more volatility ahead for tech. "I'm not convinced this tech skittishness is over. Normally, I wouldn't say one sector can drag the entire market lower, but tech is the biggest sector." Renewed trade talks between the U.S. and China helped lift sentiment in the stock market earlier on Tuesday. The Wall Street Journal first reported Treasury Secretary Steven Mnuchin and Chinese Vice Premier Liu He had resumed trade talks. The report comes ahead of a meeting between President Donald Trump and Chinese President Xi Jinping. "The overhanging issue in this market has been China, so any time you get positive news on that, it's going to be good for stocks," Schwab's Frederick said. Kudlow later confirmed these reports to CNBC that the U.S. and China were speaking again on trade. Stocks have been volatile recently as investors grapple with lingering trade fears, worries about rising interest rates and the possibility of a global economic slowdown. The Cboe Volatility index, widely considered the best fear gauge in the market, is up more than 67 percent this quarter. "I do see more volatility as we head into year-end," Michael Geraghty, equity strategist at Cornerstone Capital Group. He said trade worries, speculation about the Federal Reserve's path toward normalizing policy and political risk could keep investor jittery through the end of 2018. Elsewhere, oil prices fell more than 7 percent Tuesday to extend their losing streak to 12 straight sessions. Oil's decline on Tuesday came after Trump said he hoped OPEC would not cut oil production in order to lift prices. Saudi Arabia's Energy Minister Khalid al-Falih had said on Monday that OPEC agreed there was a need to cut oil supply next year by around 1 million barrels per day (bpd) from October levels. Crude's sharp decline pushed energy stocks down by more than 2 percent. Halliburton and Marathon Oil were among the worst performers in the sector, falling more than 4.5 percent each.